Hi! Leila Hardy here, your online intuitive Life and Business coach! Over the previous month or so, I’ve been sharing an abundance of information around Reiki, energy healing and the chakras. If you’ve missed them (where have you been!?) then you can catch up with them all here! I love nothing more than combining the subconscious mind and energy to allow you as an empath, intuitive, holistic healer or spiritually based coach to fulfil your purpose of being happy, healthy, wealthy and successful in whatever you do, with confidence in your abilities and in knowing you are enough. As well as Hypnotherapy, Reiki healing has been a huge part of my own awakening and healing journey and that is exactly why I have gone on to master Reiki and teach it to others, at all levels, from Level I & II, to Advanced, to Teacher level. 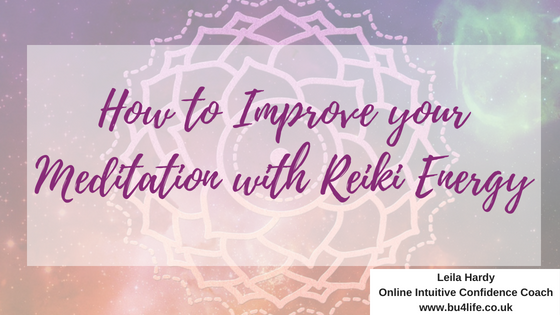 As a Life and Business coach, I also bring this super important piece into anything I do with Reiki, ensuring that those who are learning, or experiencing Reiki go on to have confidence in using it and trusting themselves, or using Reiki healing to help others! According to Wikipedia, meditation is a practice where an individual uses a technique, such as focusing their mind on a particular object, thought or activity, to achieve a mentally clear and emotionally calm state. For me, meditation can be taking part in any activity that brings stillness, peace and joy. With that in mind, movement can be a form of meditation, just as much as a guided audio can be, or sitting in silence. How can Reiki energy improve meditation? As with all Reiki healing, whatever you do, when Reiki is activated, becomes more powerful, more healing and holds even more benefits to the recipient. So allowing Reiki to flow throughout your meditation is a beautiful thing to experience. Firstly, becoming attuned to Reiki and practicing using Reiki every day in some form is so useful in improving any meditation you do; especially with techniques like the Gassho meditation, with the energy between your palm chakras being your focus for the meditation. Your meditation practice may only be 2-5 minutes to start with, don’t ever feel overwhelmed by the word meditation; it really is super flexible and versatile! What this daily practice does is help you get comfortable with silence, stillness and inner peace. Silence can for some people feel uncomfortable at times, especially if it’s new to you or you are stepping away from inner or outer drama in your life, and instead, you may notice cramps, twitches, a busy mind, aches come up as your subconscious mind attempts to pull you from the silence. Practicing with Reiki daily not only allows your to clear and heal those parts of you, but simultaneously get used to spending time being with yourself in silence, or slowing your mind down from any busy thoughts or to-do lists. As you do this regularly, you can extend the time you are taking to do the activity you are practicing; that may be a quiet walk in nature, sitting in your Heartspace, listening to a guided audio meditation, even reading a calming book. As soon as Reiki is activated within you, you are enhancing the healing and relaxable abilities of what you are taking part in! Most people who are learning Reiki are also embarking on a meditation journey; certainly I encourage all my students on Reiki Level I & II to begin a practice of 15-20 minutes of meditation every day through their journey with me as their teacher and when we embark on an Advanced Reiki journey, the powers of meditation and Reiki go even deeper to transform your health, happiness and wealth with a variety of incredible meditations that I take you through whilst using Reiki! What do you do that could be classed as meditation? Let me know in the comments!